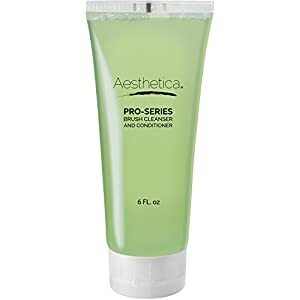 Aesthetica Makeup Brush Cleaner – Cruelty Free Make Up Brush Shampoo for any Brush, Sponge or Applicator – Made in USA – 6 oz. Specially formulated to break down product buildup and lingering grease, the Aesthetica Pro Series Brush Cleaner effectively removes accumulated makeup and dirt from all types of brushes. 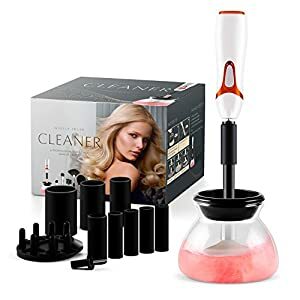 It dissolves grease while also conditioning brush fibers. The powerful yet gentle cleanser is suitable for both natural and synthetic brushes and applicators, including sponges. 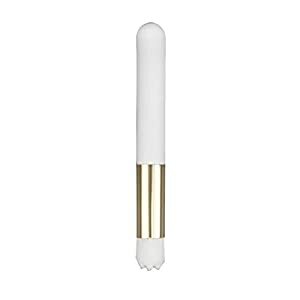 Use it on a regular basis to help prolong the life of your favorite makeup tools. Minimize skin irritation, break outs, and allergies by cleaning brushes and tools every few weeks. Ideal for using with the Aesthetica Makeup Brush Cleansing Mitt. 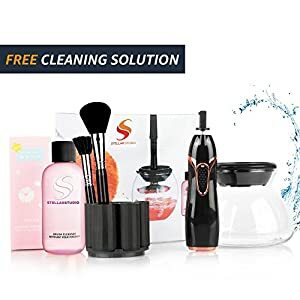 SET CONTAINS: 1 makeup brush air tower brush holder & 1 makeup brush mat. 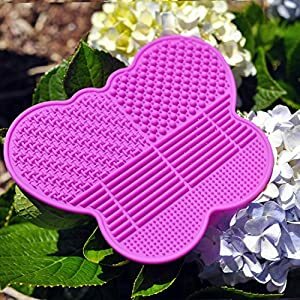 Protect the beauty brush:The makeup brush mat helps to thoroughly clean the makeup brush, and then the drying rack is used to keep the brush dry. A set of collections perfectly solves the problem of brush cleaning. 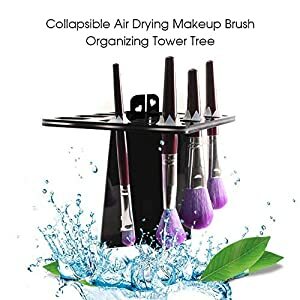 SAVE SPACE&PROTECT BRUSHES: Makeup brush tower for drying brushes after washing, makeup brush tree with total 28 mix size silicone holes- can fit for all sizes makeup brushes, art brushes etc.More convenient to hold brushes and won’t take up too much space, gain more professional makeup experience. MAKEUP BRUSH MAT: Apple shaped Small size style, it’s easy to carry. And it’s made of environmental-friendly silicone rubber material. 5 chassis on the back that easy to clean makeup brushes. 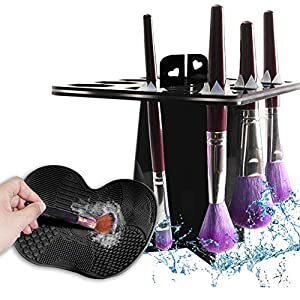 SAVE SPACE&PROTECT BRUSHES:Essential makeup brush drying rack for drying brushes after washing,more convenient to hold brushes and won’t take up too much space, gain more professional makeup experience. DIFFERENT AND FUNCTIONAL USE:collapsible and inclinable makeup brush tower, easy to carry when travel outside.The bristles face up when using the make-up powder,and the bristles face down after washing,when you have small number of brushes, it is more convenient to tilt. Makes cleaning your brushes so much faster and easier. Made of high quality silicone, very cute and will not damage your brushes. 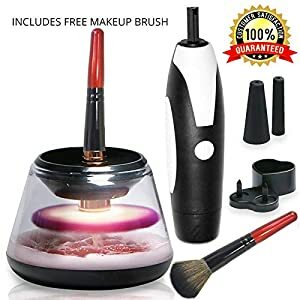 2018 UPGRADED VERSION – Scuddles 3rd generation electric makeup brush cleaner and dryer is equipped with 3 different speed levels, which is suitable for all size makeup brushes. not only effectively extending the life of the motor, But also makes it a stronger and more competent Brush cleaner. 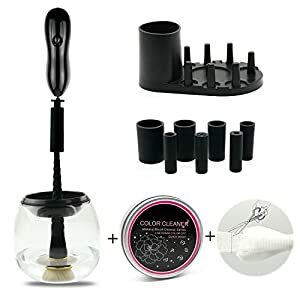 POWERFUL FEATURES – Scuddles Upgraded design makeup brush cleaner and dryer was designed to emphasize on a super powerful motor, with a total speed up to 12000-13000 rpm (Rotations Per Minute) , Ensuring That it cleans and dries makeup brushes thoroughly. 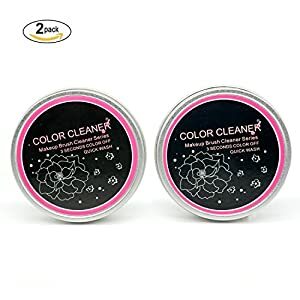 Brush Quick Cleaner and Makeup Color Removal Solution : Simply Gliding the brush against the surface of the black sponge, It will Remove Shadow or Blush Color from your Brushes Instantly and help you Easily Switch to the Next Color. Both sides of the black sponge usable. The Sponge could be washed and reused. Efficient and Environmental friendly. 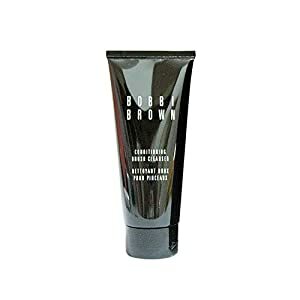 Good for removing powder color/shadow color, not for liquid. 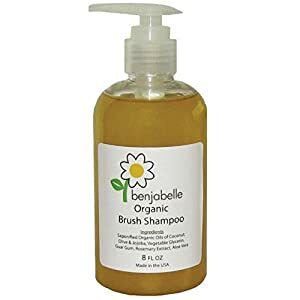 Used for Brush Color removal, cannot replace daily cleaning. SAVE YOUR TIME:Still busy cleaning the brushes before applying to next colors? Try this Magic Brush Color Removal Sponge . It will allow you to switch colors easily and quickly without switching brushes. 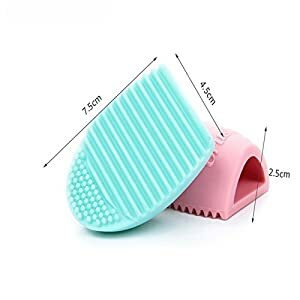 CONVENIENCE & PORTABLE:2-Pack quick brush color cleaner sponge. Small and exquisite,3*3*1 inches, easy to carry and use,is ideal for quick touch-ups anytime, anyplace.It is applicable to daily life, travel and outdoor activity to bring you unlimited convenience in your life. 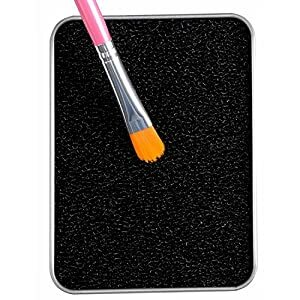 ACTICARBON SCRUBBING SPONGE: Made from acticarbon scrubbing sponge which can effectively clean your brush without damaging it.,designed for removing blush,eyeshadow,powder from brushes without water. Still busy cleaning the brushes before applying to next colors? Try this magic sponge. It will allow you to switch colors easily and quickly without switching brushes.